"Excellent athlete, good run man and pass blocker, and can run like a deer. We isolate him one on one like we did with Lachey and leave him on the same guy the whole game. He’s like Gilligan, he’s got this guy the whole game." Joe Bugel, former Redskins offensive line coach. Samuels immediately became the starting left tackle for the Redskins and has since been selected to six Pro Bowls. In 2000, Samuels was one of only four players on offense to start every game, joining Jon Jansen, Mark Fischer and Stephen Alexander. Samuels won co-Offensive Rookie of the Month for October with Dolphins tackle Todd Wade. He missed the last three quarters in the season finale vs. Arizona with a neck injury. In 2001, Samuels started all 16 regular-season games at left tackle and was voted to the Pro Bowl, he earned game balls, along with the rest of the offensive line, for two games: vs. Seattle and at New Orleans. Samuels was featured on the cover of the December 3, 2001 issue of Sports Illustrated along with running back Stephen Davis after becoming the first team in NFL history to lose its first five games, then go on to win its next five games. In 2008, Samuels was named a Team Captain played and started in 12 regular season games and was inactive in one contest with knee cartilage irritation at Detroit on October 26, seeing his consecutive starting streak snapped at 73 games. He was placed on Injured Reserve by a triceps tear on December 9, 2008, and missed the last three games. Samuels was named to the 2008 Pro Bowl but did not play because of the triceps injury. He paved the way for Clinton Portis to rank fourth in the NFL in rushing yards (1,487) and total yards from scrimmage (1,705). Portis tied for the NFL lead in total first downs (82) with Chicago Bears RB Matt Forté and Atlanta Falcons RB Michael Turner. Samuels helped Portis to have the second-most rushing yards (1,487) in a single-season in club history and opened up running lanes for Portis to post more than 120 yards rushing in five consecutive contests (121 rushing yards, at Dallas; 145 at Philadelphia; 129 vs. St. Louis; 175 vs. Cleveland, and 126 at Detroit. Samuels led the way for Portis to tie a club record for most consecutive 100-yard rushing games (5 straight contests in 2008), a record shared by Rob Goode (1951), Portis (2005) and Ladell Betts (2006). Samuels indicated during his retirement press conference with the Washington Redskins that intended to continue his career in football and become a coach. In 2010, he participated in the NFL's Minority Coaching Fellowship as an assistant to the Redskins' offensive line coach Chris Foerster. In February 2011, Samuels volunteered as the offensive coordinator at Blount High School in Prichard, Alabama. At Blount, he helped lead the Leopards to an overall record of 10–2 and an appearance in the Alabama High School Athletic Association playoffs. After only one season at Blount, in January 2012 Samuels returned to the University of Alabama to serve as a student assistant coach for Crimson Tide head coach Nick Saban. At Alabama, he will serve as an assistant offensive line coach in addition to working to complete his degree in physical education. In 2015, he left Alabama to become a high school coach at Osbourn H.S. in Manassas Virginia. Samuels was inducted into the Alabama Sports Hall of Fame as part of the 2016 class. ↑ Maese, Rick (March 2, 2010), "Redskins look to patch offensive line holes in free agency, draft", Washington Post . 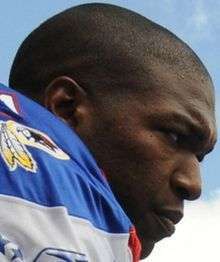 ↑ Davis, Nate (March 3, 2010), "Redskins confirm Pro Bowl LT Chris Samuels will retire Thursday", USA Today . 1 2 3 4 5 6 7 8 9 10 11 12 13 14 15 Washington Redskins bio Archived February 16, 2010, at the Wayback Machine. ↑ Mannix, Kevin (April 14, 2000), "'Bama behemoth tops so-so crop", Boston Herald, There isn't much depth among the offensive line crop in this year's draft, but there is blue-chip quality at the top in the form of Chris Samuels, Alabama's 6-foot-5, 325-pound left tackle and premier pass protector. ↑ Mayer, Larry (2007-12-15). "Samuels calls Bears coach to apologize for block". chicagobears.com. Retrieved 2008-09-07. ↑ Canavan, Tom (2008-09-05). "Giants DE Kiwanuka accuses Samuels of dirty play". Yahoo! Sports. Retrieved 2008-09-07. 1 2 "Realizing risks, Redskins' Samuels quits". ESPN.com. ESPN.com news services. March 4, 2010. Retrieved January 24, 2012. ↑ "Retired UA great Chris Samuels tackling new gig as coach". Press-Register. Mobile, Alabama: AL.com. September 21, 2010. Retrieved January 24, 2012. ↑ Boren, Cindy (February 9, 2011). "Chris Samuels will be offensive coordinator at Alabama high school". The Washington Post. washingtonpost.com. Retrieved January 24, 2012. 1 2 3 Scalici, Matt (January 24, 2012). "Chris Samuels returns to Alabama to pursue degree, coaching career". AL.com. Retrieved January 24, 2012. ↑ "James Brooks, Chris Samuels highlight Alabama Sports Hall of Fame Class of 2016". AL.com. Retrieved 2016-05-20. ↑ "Washington Redskins tackle Chris Samuels and Monique Cox embellish their Vienna home with vibrant shades of persimmon and gold". Home & Design. October 2008.